Never perform a calculation unless you already know the answer. Complex calculations are prone to human error but the simplest way to know whether the resulting answer is daft is to have a rough idea of the solution before you start. That’s where “back of an envelope” calculations come in handy. This need for approximate answers is, if anything, even more necessary when computer programs are involved since bugs will always creep into any code. I’ve always had a bias for simple models anyway. Modelling is not just about accurate prediction, it is also about improving understanding and you frequently get more understanding from a simplified model that is mathematically soluble than from a more sophisticated approach that requires convoluted numerical processing by computer. Given this, I’ve long wanted to see a back-of-an-envelope estimate of the global warming that will result if carbon dioxide levels double, as expected, over the coming century. I tried a quick and dirty calculation of this climate sensitivity in Lucky Planet where I simply linked warming over the past century to the observed increase in carbon dioxide levels. However, many objections could be made to that naive method and I think it would help the climate-change debate if there were other ball-park estimates that could also be discussed. Such approaches may be very approximate but the underlying assumptions of simple models are usually clear and transparent and this is critical for informed debate outside the circles of climate specialists. Informed debate should lead, eventually, to wider acceptance that anthropogenic global warming is real and a threat. 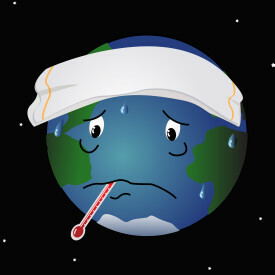 So, here’s another attempt at back-of-the-envelope global-warming and I hope it stimulates others to try and do better. My argument focusses on the early part of the Eocene epoch, around 55 million years ago, when Earth was a much warmer place than today and carbon dioxide levels, too, were higher. Good estimates of how much warmer the world was, and how much more carbon dioxide was around, therefore allow a ball-park estimate of the total warming effect of this gas. There are two reasonable constraints on temperatures at this time. Firstly, the chemistry of marine fossils allows estimates of the sea surface temperature and these suggest that equatorial temperatures were 2°C or so warmer than today’s mean tropical temperature of 27°C. More dramatically, flora and fauna (crocodiles for example) found around 77° N suggest mean annual temperatures of around 10°C within the Arctic Circle. This may even be an underestimate of the warmth since contemporaneous temperatures in Antarctica, derived from studies of fossilized tree pollen, were closer to 15°C. So, evidence from diverse geological disciplines supports the idea that our planet was significantly hotter in the Eocene and that warming was particularly prominent near the poles. where To is equatorial temperature and a is a constant. Figure 1 shows that this works well for the present day climate. The data (crosses on the plot) are taken from the SPARC project and the line shows the least-mean-square-error fit to the data assuming equation (1). Figure 1. 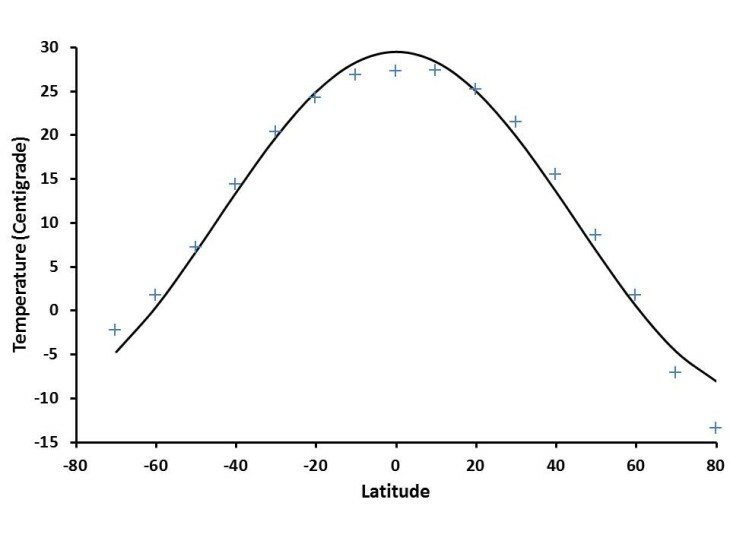 Fit of equation (1) to present-day temperature versus latitude data. Fitting equation (1) to the Eocene data then allows a to be estimated and, hence, equation (2) to give a mean global temperature of 22°C. That’s about 7°C warmer than today. What of the carbon dioxide levels? These can be estimated in many ways. 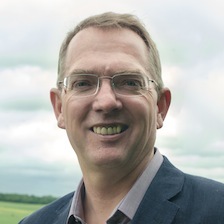 For example, the structure of fossilized leaves altered through time in predictable ways as carbon dioxide levels changed, whilst the isotopic make-up of many chemicals (such as carbon, boron, strontium and sodium carbonate) found in sediments was also affected by atmospheric composition. These different methods produce a range of CO2 estimates for the early Eocene but they cluster around 1200 ppm suggesting that levels were about 4 times higher than today. where ΔT2x is the warming resulting from doubling of carbon dioxide whilst ΔTE is the warming actually seen in the Eocene. Furthermore, CE and C0 are the CO2 concentrations in the Eocene and today respectively. Doubling CO2 should therefore produce a temperature rise half that of the Eocene, i.e. 3.5°C. Numbers quoted without error-estimates are meaningless. One of my favourite examples is that UK growth in 2013 was officially 1.8% but, without an idea of how accurate this is, we don’t know whether that is significantly different from zero since it could be, for example, 1.8±3.0%. Based upon the information actually released by the UK’s office of national statistics, we don’t know for sure whether the UK economy grew at all last year! Climatologists, unlike economists and most geologists, do understand the importance of uncertainty and that’s why they give a range of values for climate sensitivity (2.0-4.5°C). I should do the same. The biggest source of uncertainty in my analysis concerns the Eocene carbon dioxide levels. Possible estimates range from 500 ppm to 2000 ppm and so equation (3) gives 0.37 < ΔQ2x /ΔQ4x < 1.35 implying a climate sensitivity of 2.5°C to 9.5°C. The other principle uncertainty is in the temperature difference between the Eocene and today. A low climate sensitivity would require a smaller difference than the 7°C I have used here but this is largely controlled by the Arctic temperature estimate and I deliberately took a low value for that. I therefore think it unlikely that the true climate sensitivity is much less than 2.5°C. The bottom line is that my back-of-an-envelope calculation gives much the same answer as climatologists are reporting. Funnily enough, they might actually know what they’re talking about! The model is far too simplistic to be useful. Back of envelope calculations are only a start. They need to be followed up by more sophisticated calculations but that, of course, is exactly what climate modellers have been doing for decades. It could be argued that simple models are too simple to be believed and complex models potentially too error-prone to be trusted but that leaves us without any models at all. That’s the climate equivalent of sticking your fingers in your ears when someone tries to tell you that you may have been shot. Are evidence-free speculations from Nigel Lawson (a prominent UK climate-change sceptic) really a better guide to the risk than the best available science, imperfect though it may be? This is always a possibility but that’s why we need to look at different periods in the Earth’s history and also use alternate approaches such as computer climate models. If lots of different researchers using lots of different methods keep coming up with more or less the same answer, perhaps they’re onto something. Perhaps it’s albedo change rather CO2. The decrease in Earth reflectivity needed to get the warming seen in the Eocene is not feasible. Complete melting of the ice-caps did happen at this time but that made surprisingly little difference to the Earth’s reflectivity. Only 10% of the Earth is currently ice-covered and, since it’s mostly in cloudy polar regions which never fully face the Sun, this ice sees very little sunshine anyway. The Eocene example concerns climate change over thousands of years and is not relevant to the question of climate change in the next hundred years. There are indeed processes that affect climate change in the long-term but not short-term. That’s one of the key reasons why more sophisticated approaches are also needed. In any case, shouldn’t we be worried for the long-term too? Would you have posted this on a website if the results had disagreed with the scientific consensus? This is, to my mind, the hardest objection to counter. It is true that, had the answer come out very differently, I would have looked at my results very carefully indeed before committing them to public scrutiny and this kind of self-censorship may bias the evidence that is presented. The fact is, however, that the answer didn’t come out differently and, more generally, science is protected by the natural contrariness of scientists (as anyone who has been through the peer review process can testify). If there really was good, clear evidence that the scientific consensus was wrong then somebody, somewhere would be getting that evidence published. The critical part of the analysis above is palaeontological evidence for much warmer temperatures near the poles 55 million years ago. Are fossil hunters part of the hoax too? It’s solar activity not carbon dioxide. There is no evidence for substantially greater solar output in the Eocene. In fact, solar physics suggests that the Sun was 0.5% fainter in the Eocene rather than the 4% brighter needed to explain the warmer climate of 55 million years ago. So, why prefer a completely unsubstantiated explanation to the experimentally confirmed fact that carbon dioxide absorbs infra-red radiation? But perhaps astrophysicists are part of the conspiracy too! There’s nothing we can do because China will dominate CO2 output in the 21st century. This is completely irrelevant to the question: “Will increased CO2 warm the Earth?”. The fact that political and technical problems are massively more complex than anything in climatology is not a reason to stick our heads in the sand and pretend global warming isn’t happening. Looking at ice core records for the last 400,000 years I was struck by the swing of temperatures (ca. 10 degrees C) that occur in 120,000 year cycles. First, climate change is the norm. What strikes me is that global warming trends tend to be precipitous and peak for a short duration before cooling off for the next 120 K years. It seems regardless of the driving mechanism behind the warming trend, something globally happens to send the earth into a cooling spin with shorter (10’s of thousand of years), minor, warming cycles. Perhaps we (humans) are actually hastening the arrival of the next ice age. I think I might buy a fatter pair of skis and top off the tank in my car. The idea that the Earth also has internal natural frequencies of climate change which modulate other effects is a fascinating and hot topic but way beyond my expertise. The 100kyr cycles of Ice Ages are due to changes in the Earth’s orbit called Milankovic cycles. Over time, the eccentricity, obliquity and inclination shift, causing the amount of sunlight reaching Earth to drop and leading to periodic ice ages. For the past million years, the ~100,000kyr eccentricity cycle has been the dominant effect, although the reason why this dominates the shorter-period cycles is still under investigation. So humans definitely cant speed up the Earth’s orbital variations! I think most scientists would agree that, in terms of temperature, the only way is up. Good point Hugh. Michael is indeed seeing the 100ky eccentricity cycle but the effect of this is heavily modulated by the Earth’s “internal time-scales” such as the time it takes to melt, as opposed to grow, ice-caps. Hence, the “precipitous” trends he refers too rather than the nice smooth cycling of temperatures you might expect from Milankovitch mechanisms.